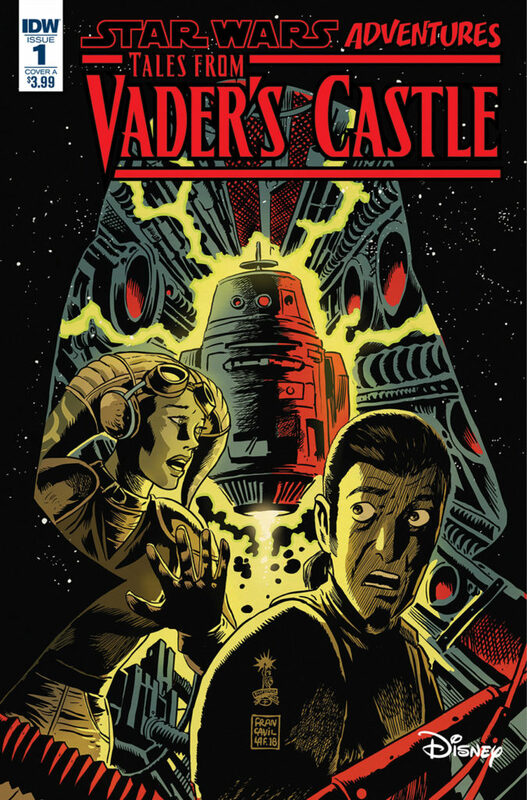 Like usual, Star Wars Adventures: Tales From Vader’s Castle #1 contains two stories. However, this time one story is nested within another. Thus readers get a taste of a new Rebel crew who winds up stranded on Mustafar in from of Vader’s castle, and a spooky story featuring the Ghost crew from Star Wars Rebels. The framing story features a female Rebel pilot and Commander named Lina Graf, and her colorful crew. There’s a human thief named Lieutenant Hudd, a bug like technician named Skritt, a bodyguard droid named XM-G3, and CR-8R who’s showed up in the previous Star Wars Adventure comics. They takes some hits from some TIE fighters and crash land on Mustafar. CR-8R warns them that they shouldn’t leave the ship, and he tells them a story that Chopper once told him. This leads to the Rebels story. Now the Rebels story has a different artist, and has a different setting. They’re searching for a contact in an asteroid field and come across a ghostly spirit of some long dead Force sensitive being who starts lashing out at everyone. Hera manages to trick the being into going into Kanan’s holocron where they trap it. It’s a nice little Rebels story with a spooky vibe, but it also raises an interesting question: is that ghost thing still in Kanan’s holocron? Or at least was it until Ezra and Maul starting playing around with it and destroyed it. I’m not really sure on the canon position of the story. Regardless, the framing story finishes up with the crew deciding to leave the ship anyway, and they head towards Vader’s castle. This sets up the next issue which will continue that story. The comic includes a cover gallery, and I’m very happy that they decided to include full page covers this time instead of the usually mini-images. Definitely more bang for the buck. All in all, a pretty good issue. I like the Halloween theme, and I definitely liked the Star Wars Rebels story. I give this one a four out of five nexus.